Acrylics are very exciting to get to know and use. 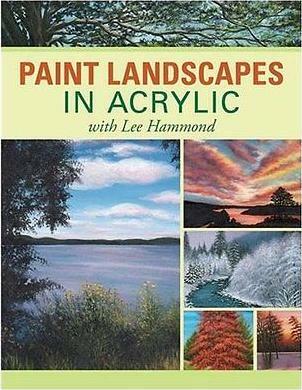 This lovely book by Lee Hammond opens up many avenues to explore when it comes to landscapes. Her gorgeous work is there to be imitated, and fortunately for the artist, it's offered in stages, with many useful pointers along the way. Accomplished artist and author Lee Hammond says she "wrote this book with the beginner in mind, keeping the steps simple and the projects unique". If you've chosen to paint landscapes, then you should enjoy this book as it's full of a wide variety of scenes to consider making your own. Ms. Hammond covers the basics like Getting Started (supplies), Understanding Color, Basic Techniques, Composing Your Paintings, Landscape Elements & Techniques, and Putting It All Together. She also says she's "kept the stages fairly simple, keeping to a three-step process". I like the exercises given as you'll learn to stipple and dab with not only a brush, but also with a sponge. You'll also learn invaluable lessons in shading. Any artist will tell you about the difficulty in getting going, but using Ms. Hammond's examples, and practicing her techniques, will really help, as much of the dreaming up of a subject has been taken care of. I liked her paintings on pages 38, 40, 48 (lovely rich colors), 83, 90 and 137. I also love her cloud pictures as I have an affinity for clouds and sunrises and sunsets and photograph them whenever I can. The stages you're taken through when painting a landscape, are the Basetones, the Awkward Stage, and Finish. The colors to use are given in each example, as are the brushes and paper or canvas options. Trees always used to scare me but I found my own way to paint them, and now I see there are easier ways (see pages 58-68). She also does many different scenes like mountains, skies, water, trees, seasonal landscapes, and of course, you can use whatever colors you choose, or stick to her selection. Conclusion - A comprehensive approach to painting, suitable for the nervous beginner. I thoroughly loved this book.